The demonstrations feature the fundamentals of vacuum and air pressure as they describe how a pump works and how to find the mass and density of an air sample. Teachers can show that a sealed balloon expands when the surrounding air is removed, a suction cup that is held on by external pressure, not suction, and that liquids boil at reduced temperature when under reduced pressure. 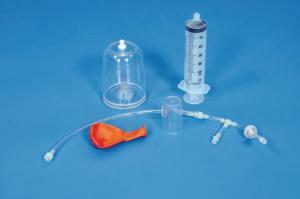 The set eliminates the need for large and expensive vacuum pumps. Ordering information: The activity includes a bell jar, a bottom plate, two hoses with check valves, a syringe (pump), two balloons, a suction cup, and an instruction manual with copy masters for four experiments.